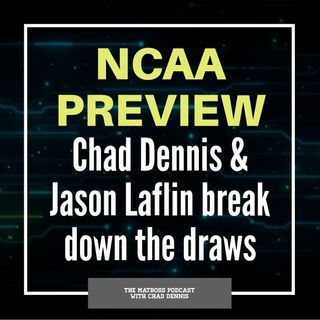 Episode 19 of The MatBoss Podcast with Chad Dennis brings the return of college roommate Jason Laflin to talk about the recently drawn NCAA Division I college pairings. About MatBoss: Created by coaches for coaches, MatBoss for iPad® integrates wrestling stats directly into the video you record for each match, completely replacing the need for labor-intensive pencil and paper scoring systems. It's the wrestling stats app our sport has been waiting for. Focus on coaching, not busy work ... See More Improve through video analysis Make data an advantage Eliminate scoring errors Increase exposure Become a digital coach For more information, visit MatBossApp.com. SUBSCRIBE & FOLLOW TO THE SHOW @MatBossApp | Apple Podcasts | Spotify | Stitcher | Spreaker | Google Play Music | RSS SUPPORT THE SHOW And if you're a fan of the extensive and broad-based reach of the shows on the Mat Talk Podcast Network, become a TEAM MEMBER today. There are various levels of perks for the different levels of team membership. If you like wrestling content -- scratch that -- if you LOVE great wrestling content, consider becoming a team member. You'll get some cool stuff too. Looking to start a podcast of your own? Get a free month with Libsyn by using the promo code MTO when you sign up. You'll get the remainder of the month from when you sign up as well as the next month free. It'll be enough time to kick the tires and lights some fires.